Water-colour of a landscape of Udagamandalam with scattered bungalows by George Hutchins Bellasis (1807-1862) in November 1851. 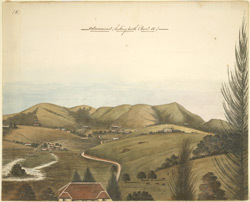 Inscribed on the front in ink: 'Ootacamund; looking north (Novr 51. )'.